Recommended where the latest Dexron-VI is required, as well as where Ford Mercon SP, Toyota WS and Mercedes Benz NAG-2 fluids are specified, Red Line D6 ATF satisfies the requirements for many of the latest automatic transmissions that require consistent, low-viscosity fluids that are shear-stable. This product is an approved GM Dexron II, Ford Mercon, and Mercedes Benz Automatic Transmission Fluid and is suitable for GM, late model Ford, or any vehicle which recommends Dexron IID or Dexron IIE or Mercon for refill. Superior stability allows high-temperature operation without varnishing valves and clutches. Also provides improved shifting in cold weather. D4 ATF also provides a GL-4 level of gear protection, making it a superior product for transmissions and transaxles like the Corvette’s T-56. The balanced frictional characteristics provide smooth and consistent shifts for extended drain intervals. The superior stability compared to petroleum ATFs allows high-temperature operation without varnishing valves and clutches which leads to transmission failure. It’s stability allows high-temperature operation without varnishing valves and clutches. Also provides improved shifting in cold weather. Designed for use in racing automatic transmissions which need the positive shift of a Type-F automatic transmission fluid, Racing ATF contains no slipperiness additives, producing faster shifts and quicker lock-up, and can reduce elapsed time in drag racing. A higher viscosity compared to conventional Type-F transmission fluids provides higher torque converter efficiency at higher temperatures and the enhanced extreme-pressure protection provides five-times better film strength when compared to petroleum ATFs, reducing gear and clutch wear considerably. Satisfies the performance requirements of Chrysler Types 7176 and ATF+4 (Type 9602), while providing 30% greater operating viscosity, 1/3 the evaporation of petroleum ATFs, and improved oxidation and sludge protection. Red Line C+ ATF provides the exact frictional characteristics required in the Type 7176 specification, providing proper shift feel and proper lockup torque converter operation. The use of an improper fluid could cause torque converter shudder or harsh shifting. Red Line C+ ATF also provides the best low-temperature shiftability in automatic transmissions allowing proper shifting at extremely low temperatures and will flow down to temperatures as low as -60°C. The improved wear protection makes C+ ATF the perfect automatic transmission or transaxle fluid for Chrysler vehicles. Perfect for heavily-loaded vehicles, this is a synthetic ATF which is a GL-4 gear oil for use where Dexron III or Mercon is recommended. Superior stability allows high-temperature operation without varnishing valves and clutches. 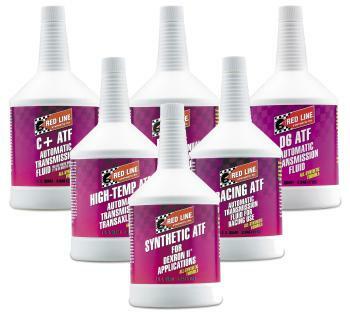 Synthetic High-Temp ATF provides the gear protection of a GL-4 gear oil in an ATF and provides a higher viscosity at higher operating temperatures, allowing the transmission to operate at 70°F higher temperature and still provide the optimal shiftability and improved torque converter efficiency. The evaporation characteristics are significantly improved, being twice as good as our Synthetic ATF and five-times better than a petroleum ATF. The improved thermal stability significantly reduces the rapid evaporation of the ATF which can produce a frothing out the filler tube. The balanced frictional characteristics provides smooth and consistent shifts for extended drain intervals. The superior stability compared to petroleum ATFs allows high-temperature operation without varnishing valves and clutches which leads to transmission failure. This product can be used in manual transmissions which require ATFs and will provide much better gear protection than a petroleum ATF; however, MTL® will provide better wear protection and better low-temperature shiftability in most manual transmissions which call for an ATF. High-Temp ATF is suitable for use in automatic and manual transmissions and transaxles where Dexron III, Dexron II or Mercon is recommended.